There are some good looking rookie wide receivers this season. A couple of them are widely available on the waiver wire, but there is more on that below. Check out the picks for waiver wire wide receivers, some of these guys could make your season. Kupp is going to catch a ton of passes. He is ppr gold. I screamed about Kupp’s potential all offseason, but based on the ownership numbers he is widely available still. Goff and Kupp have a great chemistry and the rookie is a focal point of the Rams’ offense. 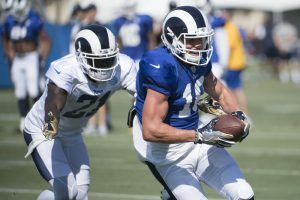 The presence of Kupp and Sammy Watkins made Goff morph into a borderline NFL quarterback. In his first game the rookie slot specialist was good for 4 catches 76 yards and a touchdown. Minus the touchdown, that is probably about the floor for weekly production. PPR gold and solid for standard leagues as well. On Sunday Matthew Stafford began earning his millions of dollars and Kenny Golladay was a big part of that. The rookie showed what a devastating red zone threat he is on the way to a 2 touchdown performance. The vast majority of the third wide receiver snaps went to Golladay right out of the gate and that will not change. If he fails to score, there could be some goose eggs this season. His odds of scoring are better than most, though. This guy is a must have, especially in standard and touchdown heavy leagues. The frequent usage of Agholor was encouraging for a receiver that was approaching bust status. It was probably a function of Alshon Jeffery being shadowed by Josh Norman. On the other hand, the top corner on the opposing team will usually be on Jeffery. That means that Agholor should find himself with a lot of opportunities to produce this season. He has struggled with drops in the past, but perhaps that is behind him. He has the trust of Carson Wentz and the starting slot receiver job. Those two things together could pay major dividends for this former first round pick. The Jets are even worse on offense than it looked like they would be. They have nothing in the receiving game, but Kearse should have some usable games. Just by virtue of being a pro caliber receiver Kearse led the team in targets, catches and yards. That is likely to be the scenario most weeks and the rest of the receivers are putrid. There are not going to be a lot of touchdowns scored by the Jets, but in PPR Kearse could be a flex. It is probably best to stay away in standard leagues. The biggest fantasy beneficiaries of David Johnson’s absence will likely be the Cardinals receivers. Of those receivers, Nelson looks to have the best rapport with Palmer outside of Larry Fitzgerald. Nelson is blazing fast but has struggled with efficiency early on in his career. If he can improve on his 44.6% career catch rate, he could be a real weapon for the Cardinals. Palmer looked to him often on Sunday and Nelson is worth a pickup in 12 team leagues, both PPR and standard. The Jaguars already anemic passing game lost its top target for the season on Sunday. Allen Robinson went out with a torn ACL and now the team must scramble for help. The most likely candidate to play the role of the number one receiver is Marqise Lee. He has put up decent stats in the past for the Jaguars, but that was before Bortles mind was broken. Odds are, the Jags will try to have Leonard Fournette handle the ball infinitely more than anyone else on the team. When they do pass, the ball will probably be going to either Lee or the nearest cornerback. Most leagues do waivers on Tuesday or Wednesday so get those claims in early. You will be kicking yourself if you miss out on some of these players. Check back often for more exclusive content and as always follow us on Twitter as well: @_knuckleheads and @brendancole16.